The Affenpinscher has a foreshortened muzzle with a pronounced stop. 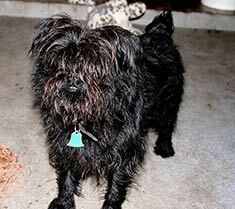 A small dog with a shaggy coat, the Affenpinscher has a square body and is deep chested. The tail and ears are usually docked in North America. The Affenpinscher is a lively class clown. The Affenpinscher originated in Germany. Affenpinschers are usually black, dark gray, tan and red. Non-shedding, the Affenpinscher's coat should never be cut and plucked only as necessary. This breed requires weekly brushings. The Affenpinscher is said to be a bit of a class clown. Stubborn, clever, curious, busy and lively, the Affenpinscher loves being with its family and will get along well with other family pets. This mischievous breed requires firm training and is a quick learner though some are difficult to housebreak. Affenpinschers will sometimes guard their toys and food. This breed enjoys camping. Affenpinschers may be prone to fractures, slipped stifle, patent ductus arteriosus, open fontanel and possible respiratory problems. Take care to ensure this breed does not take leaps off furniture. Affenpinschers can be expected to live about 10-12 years. Affenpinschers love to be played with and enjoy walks outside. This breed does not do well with temperature extremes as hot weather may be damaging to the coat. 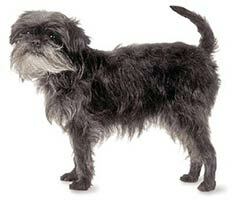 The Affenpinscher is well suited for apartment life and will get plenty of exercise indoors. Find Affenpinscher Puppies with our Free Breeder search!